The Sox have now won 4 straight games, 11 at home, and have increased the slim division lead to 1.5 games on the Twinks and 6 on Detroit. Yet as well as the Sox have been playing, it still feels like a division championship is a long way out. We received answers from 30% to 60%. Reason cited ranged from, we need another hitter to the Twinks are just really good. We then went on to ask what are the chances the Sox would win if they were to add an Adam Dunn/Prince Fielder-like left handed bat to the middle of the lineup. Not surprisingly, most answers went up. But what was surprising was how many people did not think it would help all that much. Around 50% was about the consensus if the Sox did acquire another bat. While I still don’t see Adam Dunn and/or Prince Fielder in the Sox future, I do believe the Sox division win percentage would sky-rocket if they did get one or the other. The current percentage for me is around 50%. I like the pitching a lot, I like the hitting, and I believe Ozzie has been on his game this year. But the addition of a Dunn or Fielder would take this lineup to another level. Imagine a world in which instead of Mark Kotsay, you have a good hitter in the lineup. Mmmmm, that sounds good. 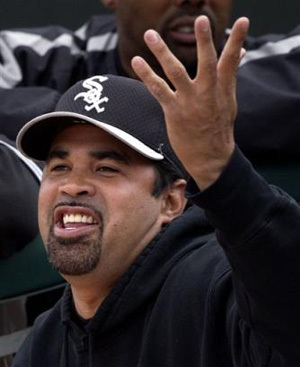 I’d say the Sox win percentage jumps up to around 65-70% if Dunn/Fielder/etc. is added to the current Sox lineup. But do keep in mind that if even 1 guy from the current 25 man roster is involved in that trade, that percentage could change pretty drastically. Or in layman’s terms, Hudson cannot go in a trade. But never forget the team motto… In Kenny We Trust.